James Witherell was born in Mansfield, Massachusetts, on June 16, 1759. He served through the greater part of the Revolutionary War, entering service as a private and rising to the rank of Adjutant in a Massachusetts regiment. Witherell was severely wounded at the Battle of White Plains. 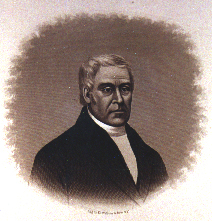 He studied medicine and law, and settled in Vermont where he held many positions of trust, including that of Judge, member of the Governor’s Council, and of the Legislature. He was elected to Congress in 1807. Prior to his resignation, he participated in the debate and eventually voted for the Act that abolished the slave trade, which was passed in 1808. He resigned his seat to accept an appointment by President Thomas Jefferson as one of the Judges of the Supreme Court for the Territory of Michigan. He was married on November 11, 1790 to Amy Hawkins and the couple had six children. His son, B.F. Witherell, later became a Justice on the Michigan Supreme Court and his grandson was Senator Thomas W. Palmer. James Witherell died in his Detroit home on January 9, 1838.